Update: 2/6/12 The DisneyStore.com updated the picture on the SB commemorative figure to represent the Giants designed figure. Apparently it is the same figure as we showed you in the ad from last night. I’m a little disappointed in the design as I thought this was just a placeholder. Other than the logo on the chest, it doesn’t really say New York Giants. The colors are a generic red and yellow instead of Giant blue. I suppose it is possible this is also a placeholder. Also of note, the status of the figure has been changed to backordered. 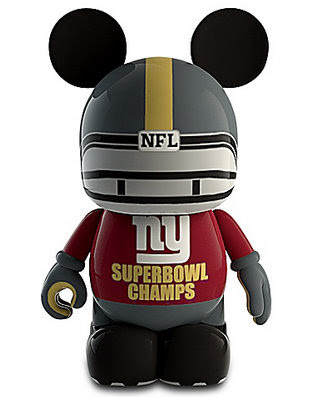 2/5/12 Much to this podcast host’s dismay, the New York Giants colors and logo will adorn Disney’s commemorative Vinylmation. 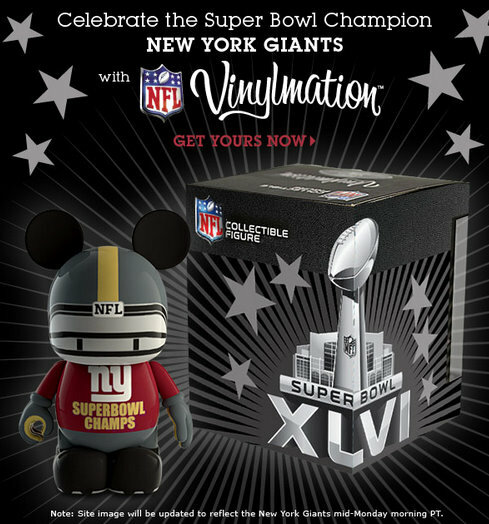 Note the small print: “Site image will be updated to reflect the NYG mid-Monday morning PT.” Here is a screen shot of the DisneyStore.com’s listing as of about an hour after the game. You can actually add this item to your cart and purchase it right now. Guess Eli Manning saved me $18.95 tonight. This limited release vinyl complete with Super Bowl XLVI logo on helmet was designed by Eric Caszatt. 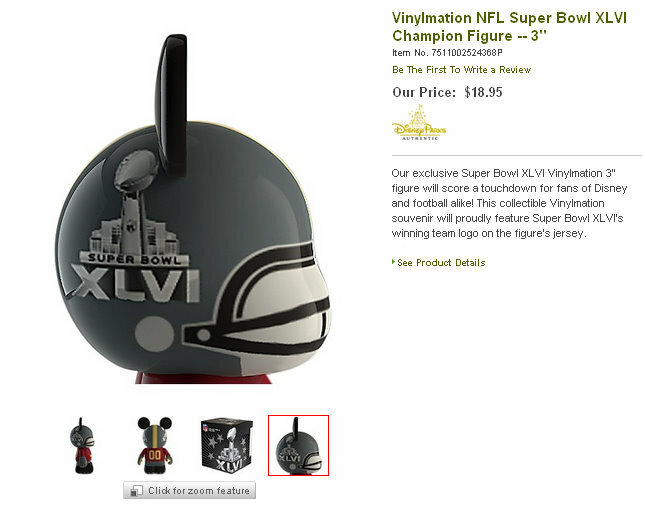 The price is a bit higher than the regular NFL teams figures, but it is a commemorative item. What say you Giants fans… adding this to your collection? I’m not a giants fan but, am so happy they won and this will definitely be in my collection!